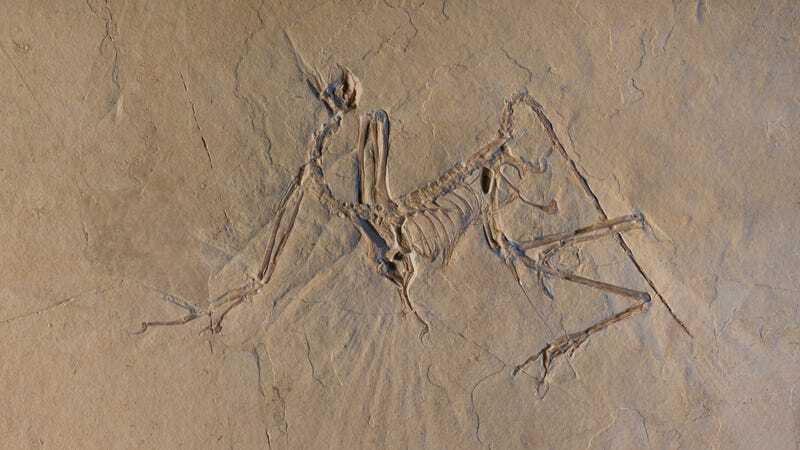 An Archaeopteryx fossil used in the study. Owing to its distinctly bird-like features, Archaeopteryx is one of the most intriguing dinosaurs known to science. Since its discovery some 150 years ago, paleontologists have wondered if the Late Jurassic dinosaur could actually fly. New research suggests the answer is yes—but its flying style was unlike anything seen today in modern birds. New research published today in Nature Communications is the first to show that Archaeopteryx (pronounced “ar-kee-op-ter-icks”) had the physical attributes and bone structure required for active flight, and that this animal was meant to fly, albeit in bursts over short distances. But because the now-extinct dinosaur featured a bone structure not seen in modern birds, the authors of the new study aren’t sure what Archaeopteryx’s flying style actually looked like. Archaeopteryx is the quintessential intermediary species. Like modern birds, it had feathers along its long arms and much of its body, but it also had very un-bird-like teeth and a long bony tail. What’s more, the bones in its hands, shoulders, and pelvis were not fused and reduced as is the case in living birds, which is why Archaeopteryx, which barely measured a half-meter in length, is considered a transitional species between reptiles and modern avians. As any first-grader can tell you, birds evolved from dinosaurs, but the pathway taken from terrible lizard to the graceful birds we see today isn’t totally clear, nor is it obvious how the capacity of flight first emerged in dinosaurs. Artist’s depiction of Archaeopteryx in flight based on the new study. That’s why Archaeopteryx is such an important species. At 150 million years old, it’s quite possibly the oldest potentially free-flying dinosaur that we know of. Unfortunately, scientists don’t know if this animal used its wings for passive gliding or powered, active flight. Another possibility is that Archaeopteryx was a ground-dwelling animal that didn’t fly at all, using its wings for something else, like snatching prey, leaping, or sexual displays. Indeed, it’s difficult to infer physical capacities, movement styles, and behavior from fossilized etchings carved onto rock. It’s obviously helpful to compare what we see in fossils to the living animals around us, but in some cases (actually in many cases), extant animals bear only the slightest resemblance to dinosaurs, Archaeopteryx included. To get a better sense of Archaeopteryx’s flying abilities, researchers from the European Synchrotron Radiation Facility in Grenoble, France, Palacký University in the Czech Republic, and several other institutions, studied the dinosaur’s wing architecture in detail. To do so, they used a non-invasive technique known as phase-contrast synchrotron microtomography, which allows scientists to visualize the interior of fossilized bones in three-dimensions without damaging them. The researchers focused on the middle part of the arm bones because those sections have been linked to flight-related abilities in modern birds. The researchers took their results and compared them to a number of known animals capable of flight, including extinct pterosaurs and living avians. In the final analysis, the researchers concluded that Archaeopteryx exhibited a physical architecture and bone-structure consistent with the capacity for flight, and that these traits most closely matched living birds who use their wings to fly short distances in bursts, such as pheasants. Archaeopteryx was a carnivorous dinosaur that may have used its limited flying abilities to capture prey. That said, much of Archaeopteryx’s unique anatomy suggests it used a flapping motion and an aerial posture not seen in modern birds. As to what its flight style might have looked like, the researchers don’t yet know. Future studies will have to figure this out. Pittman, who wasn’t involved in the new study, says Archaeopteryx utilized an alternative flight style owing to major differences in the shape of its shoulder and arm bones, compared to modern birds. And crucially, it didn’t have a breast bone, which anchors the major flight muscles of living birds. “The authors suggest an alternatively oriented flight stroke, but to confirm short or burst flight in Archaeopteryx would require demonstration that this alternative mechanism could produce these flight styles,” said Pittman. Excitingly, however, this new study shows that dinosaurs were actually flying 150 million years ago, and likely even earlier, given Archaeopteryx’s highly developed wings and bone structure. This animal was geared for flight, even if it was over short distances. Pheasants don’t fly like eagles or albatrosses, but they’re not completely grounded. When startled, pheasants burst into the sky at speeds reaching 38 to 48 mph (60 to 77 km/hr), and when chased they can hit 60 mph (96 km/hr). We don’t know if Archaeopteryx was as capable in the air as the modern pheasant, but thanks to this latest study, we’re an important step closer to finding out.